C. S. Lewis noted that he was shaken by reading Anders Nygren’s famous book Agape and Eros(1932) while in his thirties. 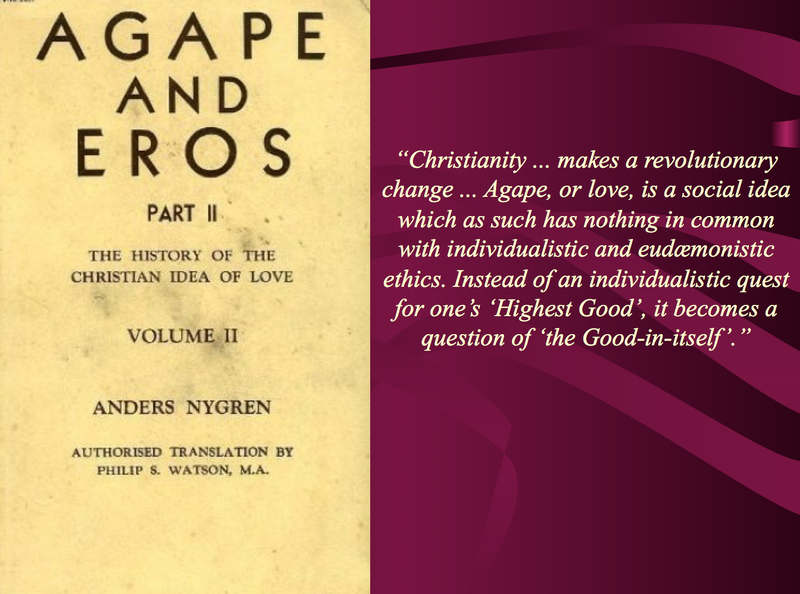 Nygren’s antithetical juxtaposition of eros and agape had become enormously influential in twentieth century Protestant theology. Among other controversial claims, Nygren argued that human love is always selfish. 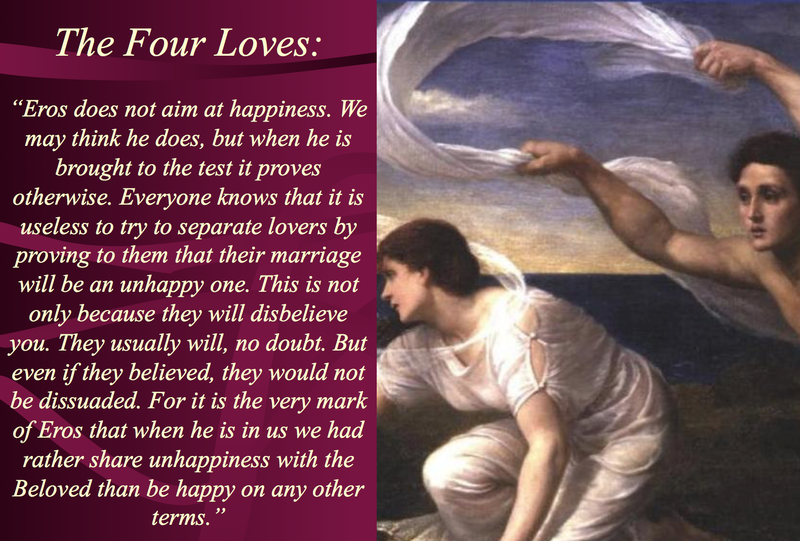 In The Four Loves(1960), C. S. Lewis vehemently denies this claim, and constructs his own theology of love. The lecture will evaluate this most important disagreement between these two prominent scholars, including its profound implications. Contrary to what Nygren thought, Lewis contends that the pursuit of happiness is not morally culpable and even eros has the dawn of agape. While arguing for this view, however, Lewis was driven to some exaggeration. 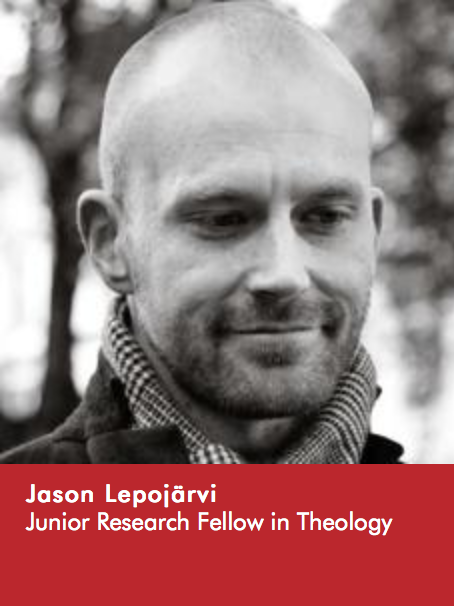 Jason Lepojärvi is a Junior Research Fellow in theology at St. Benet’s Hall, Oxford, a Ph.D. Candidate with a dissertation to be defended in early 2015, and a former President of the Oxford C. S. Lewis Society. Born to a Canadian mother and a Finnish father, he studied theology and philosophy at the University of Helsinki. His master’s thesis (2008) on the theology of the body and sexuality by John Paul II was later published as the first introduction to the subject in Finnish (2012), and his upcoming doctoral dissertation (2015) is on C. S. Lewis’s theology of love. His research interests lie in Roman Catholic and Protestant philosophy and theology, more specifically, philosophy and theology of love, the body, sexuality, worship, and idolatry. In 2014, he won the Karl Schlecht Award. http://www.st-benets.ox.ac.uk/-fellows. See also Joseph Pieper, The Four Cardinal Virtues. Report: Jason Lepojarvi, gave a careful and thoughtful exposition of the difference in view on the meaning of love (agape versus eros) in the work of Swedish scholar Anders Nygren and Oxford English scholar C.S. Lewis. Essentially, Lewis legitimizes various types of human love (including eros), whereas Nygren only accepts God’s love through the person (agape) as legitimate and holy. The individual human is eradicated in Nygren, who sees eros or romantic love as selfish (denigrated) love; it is always eudaemonistic, egocentric or happiness-seeking. Nygren’s division has greatly impacted modern Christian theology, which has not sufficiently engaged with the potential diversity in expressions of human love towards other humans and the divine. Jason Lepojarvi explored how Lewis seeks to correct this bi-partite view of love, seeing an agapic opening in eros. Lewis believed that eros had nothing to do with seeking happiness, although Lewis’ position is perhaps an exaggeration in order to counter Nygren. Critical dialogue in this area opens a space for Christian academics to engage scholars from across disciplines (including theology, philosophy and sociology) as to the motivations behind human love and relationships. After Jason’s nuanced talk, many attendees joined him at dinner and enjoyed further discussion. Jason holds great promise as a young scholar; everyone appreciated his visit and the grace of his persona. He also lectured at Regent College the previous evening.